Solar array at Santa Fe Skies RV Park from the east end. 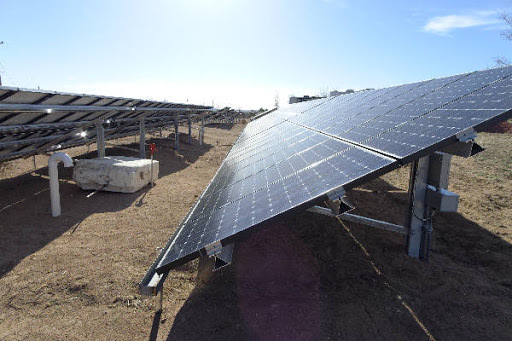 We got back to Santa Fe and settled in at Santa Fe Skies RV Park and were dazzled by the new solar array the Brown family installed. While large solar arrays are nothing new, what is amazing is that this is a small private RV park. This isn’t something the local utility or the state or county did. Just a small 235 space RV park that is sick of paying the utility company at a growing rate. Since visitors don’t pay for electric power, this is a big cost savings to the park. With the rig hooked up and safe, we reserved a car-trailer and headed back to Arizona to retrieve the Highlander. Now that was an experience. All went well with picking up the new trailer. We arrived in Tucson well ahead of closing time and were able to drive the 40 miles back to Benson before dark. We stowed the car while it was still light then took the dogs to a motel for their first ever stay. It took about 2 seconds to realize that dog owners get to stay in the same room previously damaged by another dog (or more likely the dog’s owner!). But it went well and they didn’t bark too much. Breakfast was a Kind Bar and a couple donuts from Suzy’s… best donuts in southeastern Arizona! Nothing like a healthy breakfast to start the day. U-Haul tire repair… thank you U-Haul! So off we went to Santa Fe. 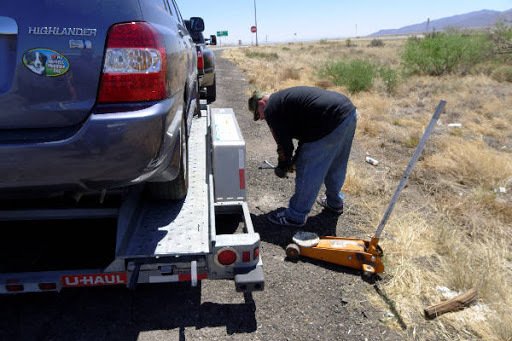 We’d gone perhaps 90 miles- somewhere just before the New Mexico state line- when a car pulled up beside us and the driver frantically pointed at the trailer. We pulled over and… what a bummer. The right-rear trailer tire was flat and, though not yet shredded, was clearly not going to hold air ever again. I stayed on the shoulder and crept along maybe 2.5 miles to the first available exit and called U-Haul. It took a little longer than they said, but in an hour a really nice tire-dude showed up with a new tire and wheel to replace the now completely shredded original. In a few minutes we were again on our way to Santa Fe and had further problem. But I was left with the conviction that, if you’re going to pull a U-Haul (or anything else for that matter), you need to stick to Interstates or major highways where you can expect cell service. We settled into a different site at Santa Fe Skies which looked like it might be easier to back into. I’m the first to admit that I’m terrible at parking the rig so I try to make it as easy as possible regardless the view another site might have. Now that we’re in the site I realize that we’ll be taking a tour of the back portion of the park in order to leave, but that shouldn’t be a big deal. Our medical appointments started right away with me leading the parade. All went well including my eye-pressure check, plus I got a referral to see someone for a vitrectomy of my right eye. The floaters are getting really bad and, since it was such a miraculous improvement in my left eye, I’m anxious to get it done on the right. 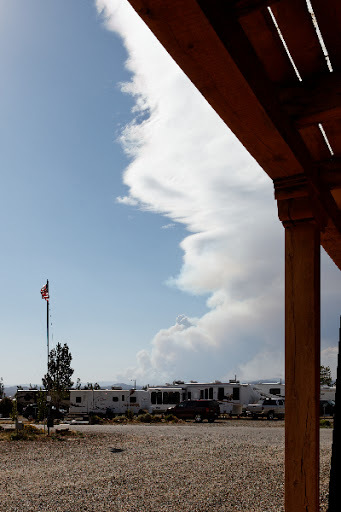 las Conchas fire (los Alamos) the evening of 26 June. las Conchas fire about 3 PM 26 June. Even though it’s now part of the las Conchas fire, we still see smoke from the Cochiti area. Pacheco is 80% contained with 10,500 acres burned. And the cost so far is $9,000,000 for Pacheco and $37,000,000 for las Conchas and growing. Yikes! 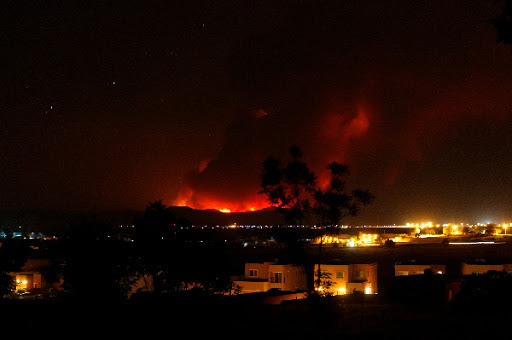 This is what las Conchas looked like from Santa Fe Skies a few hours after it started on 26 June 2011. While we’d like to get on our way to Maine to visit our family, I’m not sure where we can go without either being too hot or in danger of yet another fire. What a summer! This entry was posted in Uncategorized and tagged blowout, fire, las Conchas, solar array, U-Haul. Bookmark the permalink.